Kerala, the god’s own country, is in fact a temples’ own country which can be gauged from the density of temples in the land. In terms of the number of temples per square kilometre, Kerala is second to none. Beneath the lush green canopy of the state, stands a zig-zag chain of temples, which are known for many things: powerful gods, traditional customs, patronage to arts and festivals, elegant architecture and serene surroundings. But if you are a foodie you can add some more things to the list such as Payasams, delightful snacks and even delectable full-course meals that are served at the temples for the visiting devotees. Each temple in Kerala has a food specialty of its own and these would make you crave for a second helping! So, let us take you on a food trail through temple food delicacies. The Legend: It is said that one day Lord Krishna, disguised as an old man, visited the Ambalapuzha Palace and challenged the King for a game of chess. It was decided that if the old man wins, he should get rice grains as per the 64 squares of chessboard. The progression of spreading the grains will be one grain on the first square, two on the second, four on the third, and so on till the 64th square. On losing the game, the king tried to meet the winner’s demand, but he realised that he did not have enough rice grains. Then Lord Krishna showed his real identity and asked the king to pay the rice grains in instalments and prepare Palapayasam each time. Thus, the Ambalapuzha Palpayasam was born. It is believed that Lord Krishna comes to the temple every evening to taste this Payasam. Bhog Timings: Payasam is ready by noon. One litre costs Rs. 100. Payasam is available till the day’s stocks last. Where Else: Hotel Chaitram, run by Kerala Tourism Development Corporation, situated opposite to Thiruvananthapuram Central Railway Station, offers specially prepared Ambalapuzha Palpayasam on its road-side counter. 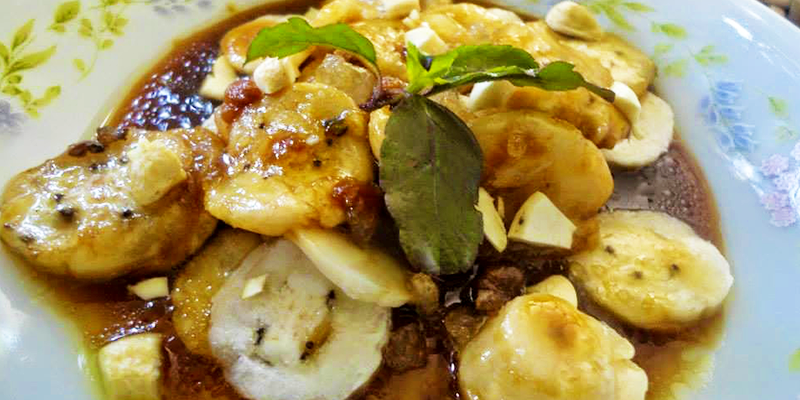 Unniyappam is a tiny, round roasted rice cake made of jaggery and banana. The snack is available all across Kerala in bakeries or snack-shops. But the best of the lot is available at Kottarakkara Ganapathi Temple. It is made using rice, jaggery and a special variety of banana called Kadali. This is said to be Lord Ganapathi’s favourite snack item. The Legend: Lord Shiva had been the major deity of the initial temple. At a later date, the temple was redesigned by the legendary architect – Perunthachan and Ganapathi was installed as the main deity. 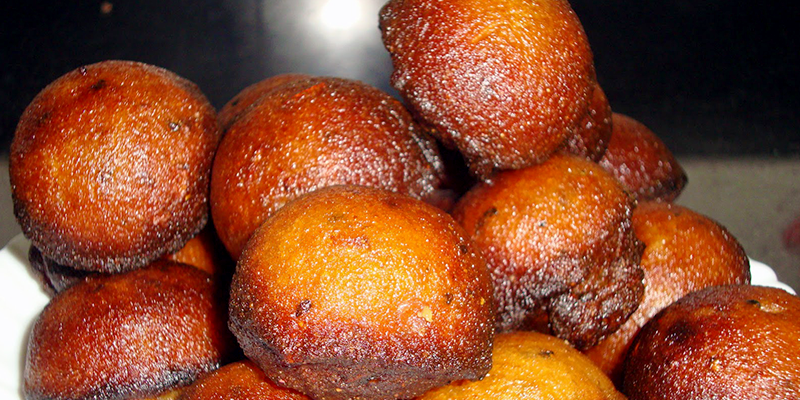 When the new structure was completed, a specially prepared unniyappam was the the first offering to Ganpathi. The devotees liked this tiny sweet so much that the offering has continued till date. Bhog Timings: Unniyappam is available from 6:30 AM till 8 PM (or till the day’s stocks last). A packet of 10 costs Rs. 15. Note: This snack is served as Prashad on most days, but not all days. 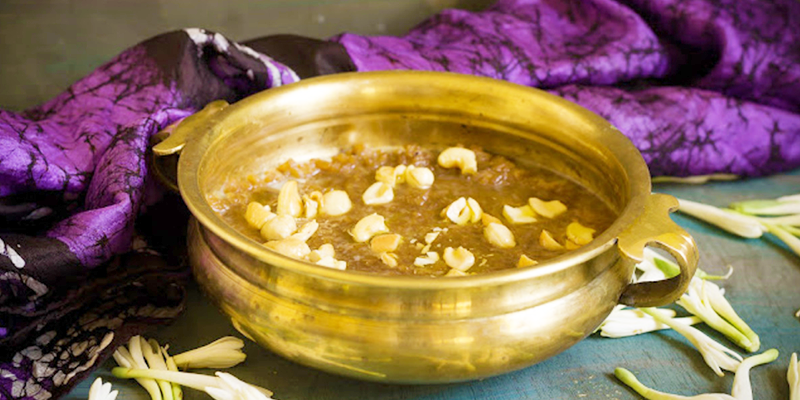 Aravana is another kind of rice pudding made of jaggery and ghee. It is not boiled, but roasted. So, it lasts for several weeks. 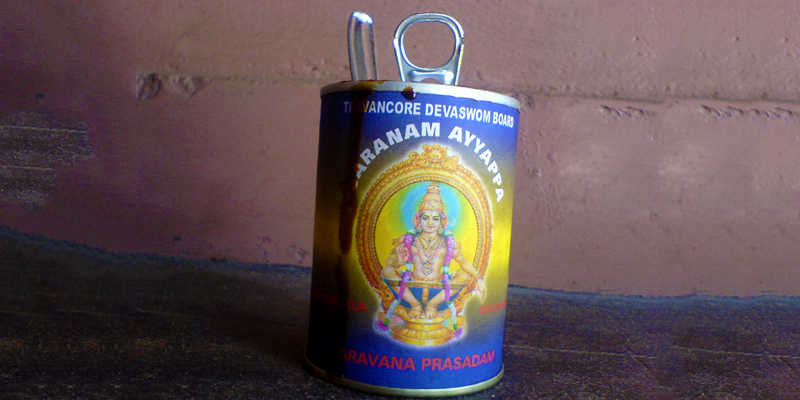 Many temples in Kerala have aravana as their offering. The most famous one is the aravana from Sabarimala Temple. Sabarimala temple and Lord Aiyyappa need no introduction. It must be the most visited temple in Kerala. People from Andhra Pradesh and Tamil Nadu take the annual pilgrimage to the temple. Aravana is commercially prepared for the temple and it is available in plastic bottles. Temple Timings: 4 AM – 11 PM. Note: The temple is open for Darshan only during specific days in a year. Each year, the temple administrators publish a calendar mentioning when the temple remains open for Darshan. Do check out the calendar before proceeding. Thrimadhuram literally means the triple sweet. It is made of sugar, banana and honey with a tinge of ghee. It is not something that is difficult to prepare. But the one available in Thirunelli Maha Vishnu Temple has a taste of its own. The taste lingers on your tongue for many days after you have tasted it. 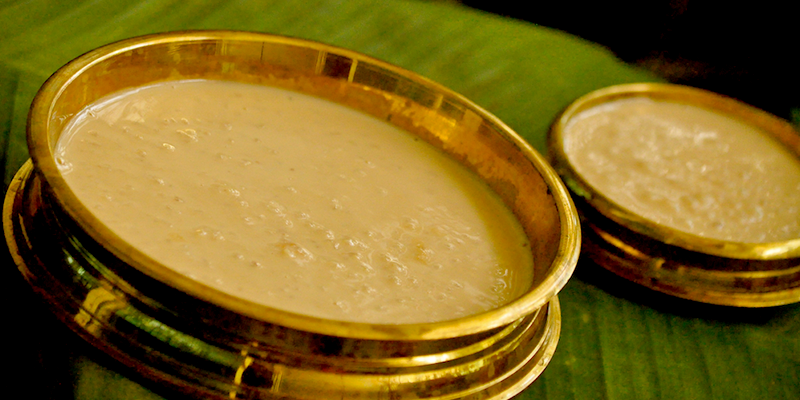 The temple also offers Neypayasam (or the ghee-rice pudding). The Legend: There is an ancient stone aqueduct within the temple premises, which carries water from a nearby forest stream to the temple. It is held that the water carries a unique taste. And locals believe that the use of water, from the specific aqueduct, provides the unique taste to Thrimadhuram. Bhog Timings: Thrimadhuram is sold at the temple’s administrative office throughout the day (subject to availability). If you are looking a full-fledged Kerala feast, head straight to Aranmulla Parthasarathy Temple. It is one of 108 Sacred Lands (or Divya Deshams – a group of temples of Lord Mahavishnu Temple revered by 12 ancient saints). The temple offers a full-course Keralan feast, called Aranmulla Valla Sadya, for just over two months every year. It coincides with Onam celebration and the season of Boat racing in Kerala. 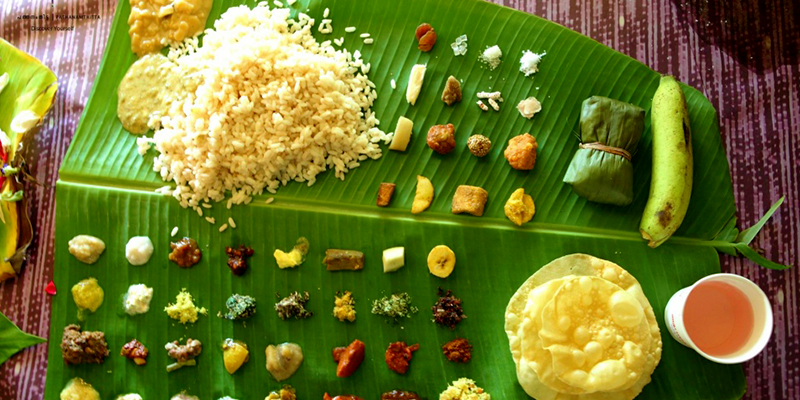 Aranmulla Valla Sadya comprises of 64 dish varieties. The Legend: In the olden days, the farm produce from Aranmulla and nearby villages were transported by water through Pampa River. All the land belonged to the king and large boats were used to take the farm produce from the fields to the king’s palace. One day, when that year’s Onam festival was nearing; one such boat got stuck on the river near the temple. The boat was filled with farm produce. No amount of labour or force managed to move the boat by even an inch. It did not sink either. The king arrived at the scene and when all other options failed, approached the palace astrologer. He conveyed that the boat was halted by Lord Krishna himself and boat would move only if sufficient rice and other farm produces are given to an impoverished local Brahmin family for preparing their Onam feast. The kings obliged and sent sufficient rice and vegetables to the Brahmin family. The king also decided to conduct an Onam feast every year so that there would be no one in his country starving during Onam. And that feast is now called Aranmulla Valla Sadya. Bhog Timings: Aranmulla Valla Sadya was held between July 15 and October 2, 2016. Trivia: There is a unique way of asking for specific dishes at the feast, you have to sing a song naming the dish you desire and the organizers will provide it instantly. Note: You need tickets or passes to attend Aranmulla Valla Sadya. Friends and relatives from the area can give you such passes. Otherwise, book online. Did you like this trip through divinity with an underlying gastronomically biased intent? I want to cover these temples on my next trip. Can you tell me the route for above mentioned temples, as well as local food delicacies and special functions held within the temples. Finally, which is the best month to visit Kerala?